Either TF2 players really love Japan, or they really love virtual hats. A few weeks ago, Valve added three new in-game hats to the TF2 store in order to raise money for relief efforts in Japan following the devastating Sendai earthquake and tsunami. 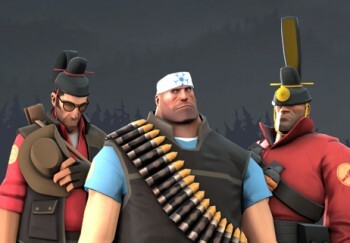 The "Humanitarian's Hachimaki," worn here by the Heavy, sold for $7.99, the "Benefactor's Kanmuri" (Sniper) went for $19.99, and the "Magnanimous Monarch" (on the right) cost a staggering $100. For all we joke about the game becoming Hat Fortress 2, Valve's charity drive worked astoundingly well. According to the Valve TF2 blog, in just two weeks players bought $430,543.65 worth of hats to donate to disaster relief funds. That's more money than it costs to fire Sasha for twelve seconds, don't you know? Joking aside, that's really heartwarming to see such generosity from gamers, especially in a sluggish economy. Special mention goes to the crew at the Unusual Hat Club, who managed to raise $3,000 on their own. It may not be $430,000, but every little bit helps.